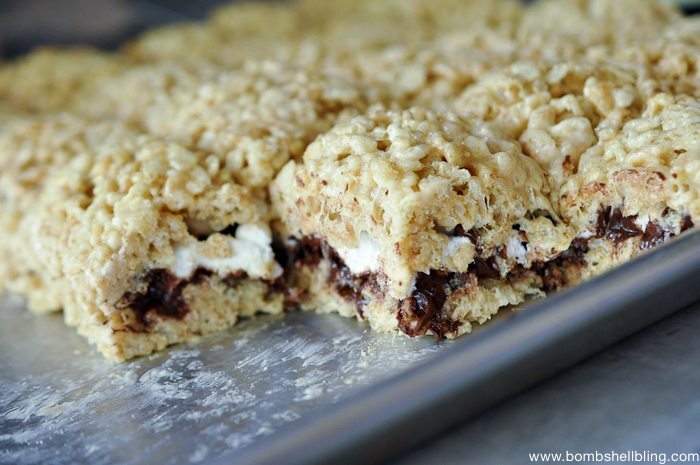 These S’mores Rice Krispie Treat Sandwiches are a fun new twist on an old favorite treat. 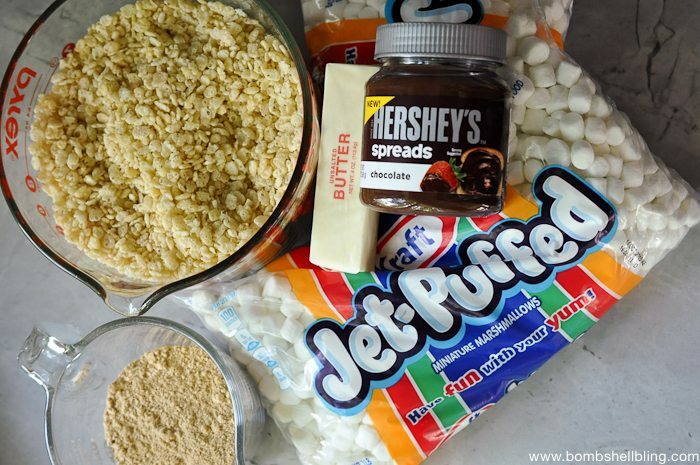 Here is what you will need: graham cracker crumbs, Rice Krispies, a bag and a half of mini marshmallows, Hershey’s spread, and butter. 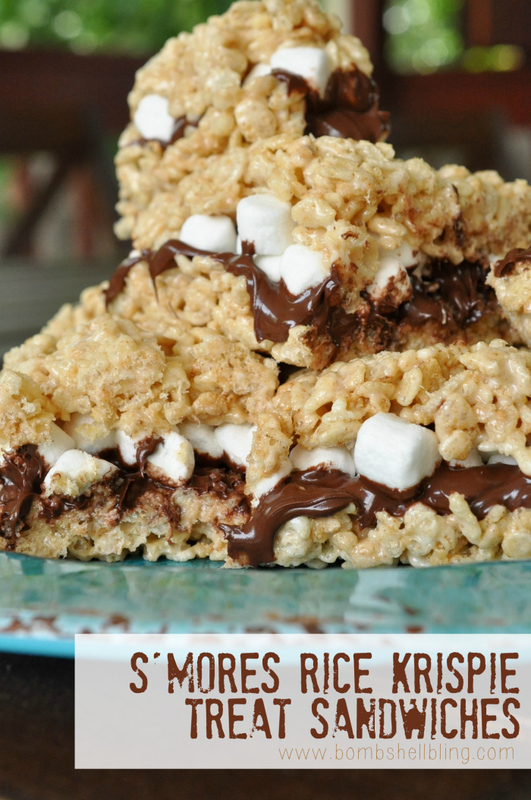 Mix the graham cracker crumbs and Rice Krispies together and use them to make Rice Krispie treats in the usual way. (More specific instructions below.) Press the mixture into a cookie sheet so that they are thin. 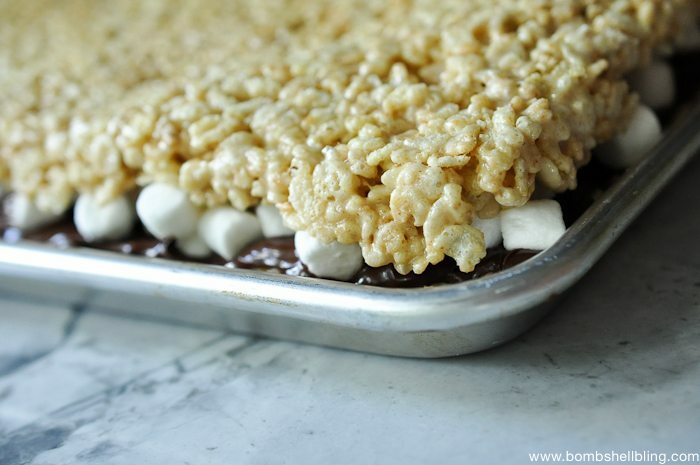 Allow the Rice Krispie treats to cool. 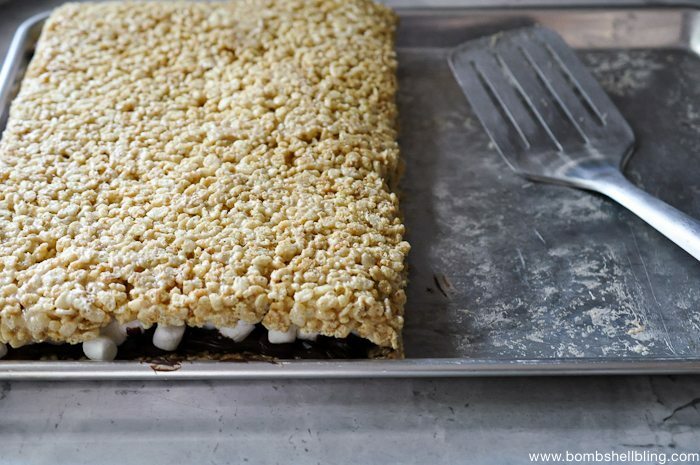 Cut the pan of Rice Krispie treats in half. On one half slather it with the entire jar of Hershey’s spread. YUM. Top liberally with mini marshmallows. 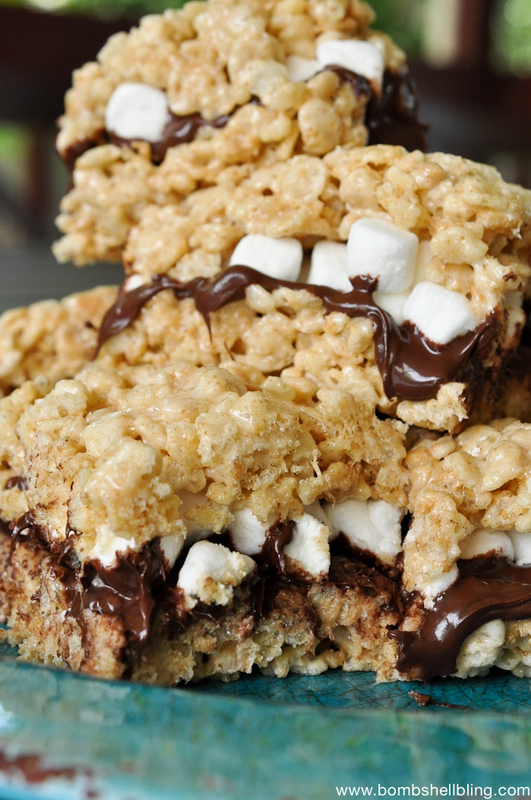 Now use a spatula to flip the remaining Rice Krispie treats on top of the marshmallows to create a giant Rice Krispie treat sandwich of deliciousness. 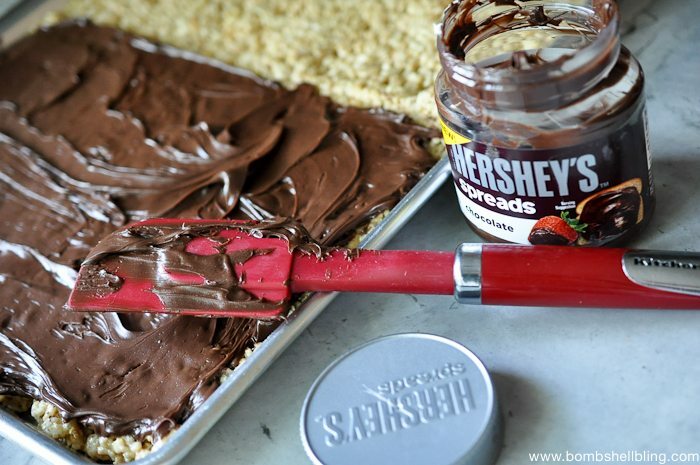 1 – Prepare ahead by mixing together the Rice Krispies and the graham cracker crumbs. 2 – Melt 1 stick of butter and 1 (16 oz) bag of mini marshmallows in a large pot over medium high heat, stirring constantly. 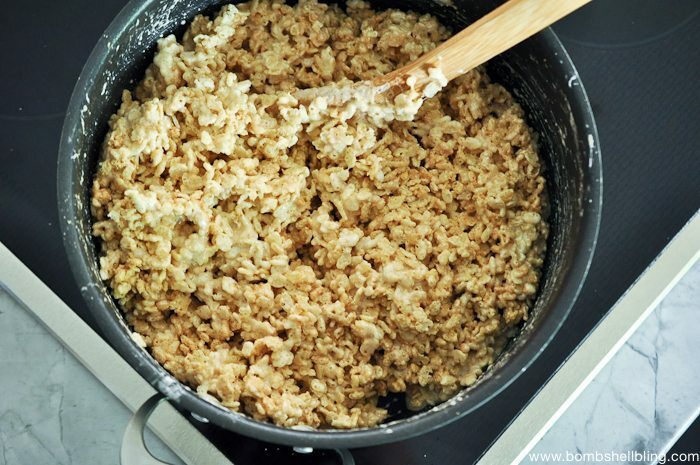 2 – Add the Rice Krispie and graham cracker crumb mixture to the pot and stir together well. Remove from heat. 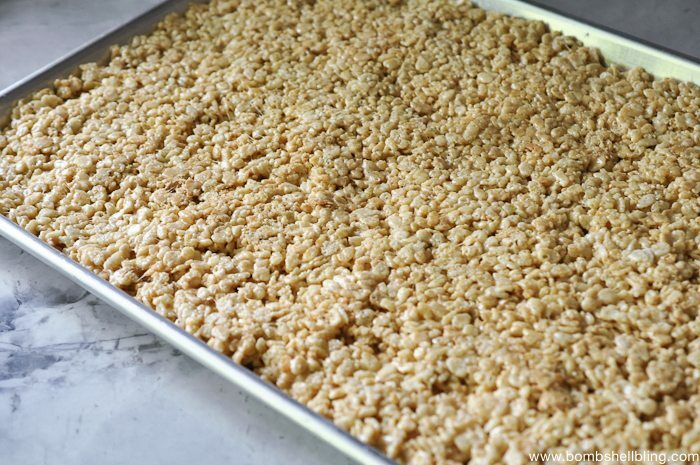 3 – Scoop the Rice Krispie treat mixture from the pot and press it out thin onto a large cookie sheet. Allow to cool. 4 – Cut the Rice Krispie treats in half. Slather the Hershey’s spread liberally onto one of the halves. 5 – Top the Hershey’s spread with mini marshmallows. 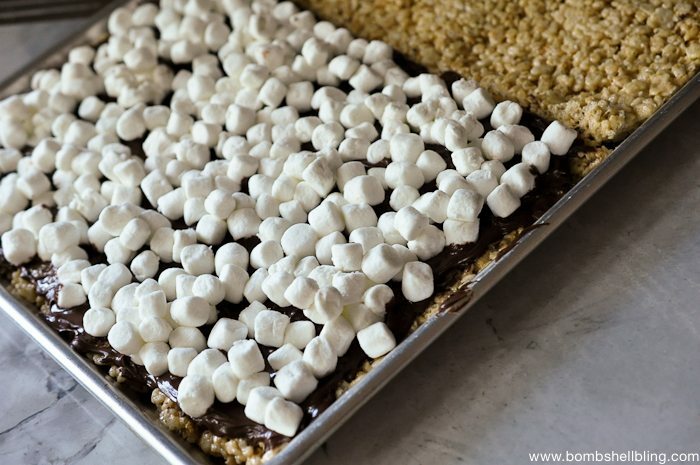 6 – Use a spatula to flip the remaining Rice Krispie treats on top of the mini marshmallows. 7 – Cut up and enjoy! 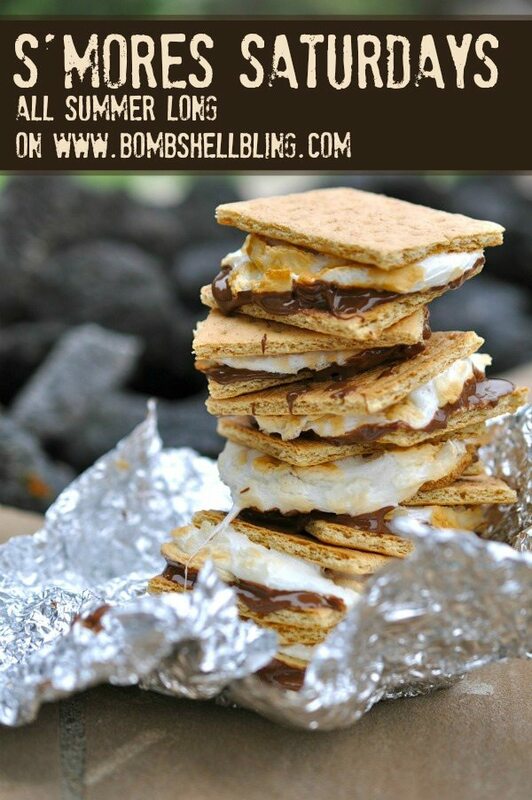 I hope that you try this recipe, and that you come check out the other recipes in my S’mores Saturdays series! Sarah McKenna is the scattered creative mind behind the blog Bombshell Bling. Sarah adores all things Halloween, s’mores, colorful, kid friendly, snuggly, and, of course, BLINGY! 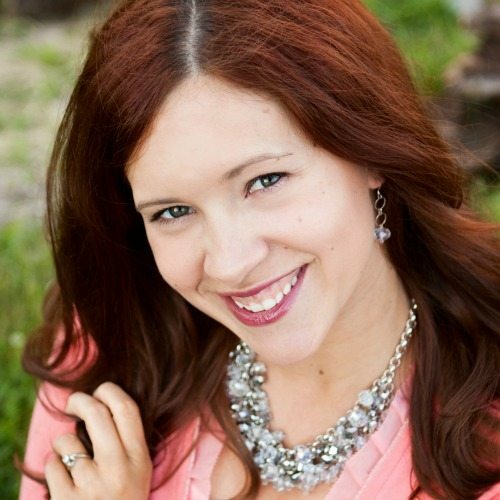 A former elementary school teacher, Sarah is now a full time stay-at-home-mom and part time blogger and jewelry designer. Sarah began blogging as a creative outlet during her battle with severe postpartum depression, and she continued blogging because of the fulfillment that she found in building her own business, creating new things, and forming friendships with other bloggers. When she is not blogging or chasing children, Sarah can be found singing at the top of her lungs, reading slightly saucy historical fiction novels, or laughing far too loudly at her favorite sitcoms.